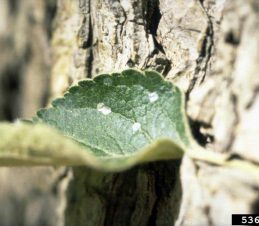 After mating, adult moths lay eggs on leaf surface or fruit. After hatching, larva burrows into fruit. After exiting the fruit, pupation occurs under loose bark or nearby debris. Following pupation, adult moths emerge and begin mating. Larvea pupate in the spring and adults usually begin to emerge in early May and continue emerging till late June depending on the temperature. Mating and egg laying occur when twilight temperatures are above 15°C. 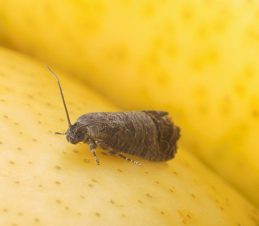 In the Okanagan there can be up to three generations of codling moth per year. Second-generation and third generation larvae can cause considerable damage, because they appear so close to harvest. Codling moth eggs are 1-2 mm in diameter, flattened, elliptical and almost transparent. The eggs are laid individually on leaves or fruit. Their small size means they are rarely seen. Newly emerged larvae are about 2-3 mm in length and pale creamy white with a black head capsule. Mature larvae are approximately 12-20 mm in length and are cream or pink with a brown or black head. 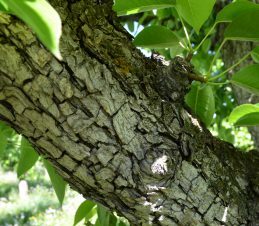 It is the larvae of the codling moth that causes the damage to the fruit of the trees. 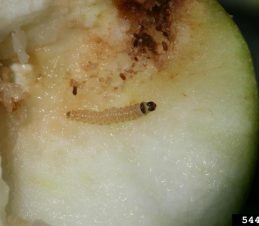 The codling moth larva feeds in the centre of the fruit on flesh and seeds. 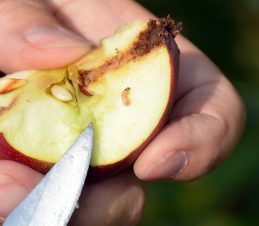 Once the larvae are mature they will leave the fruit and look for a protected place to spin a cocoon, for instance under loose bark and in cracks and crevices, in the soil, or in wooden materials under or beside infested trees (e.g. bins, ladders, poles, buildings, and large prunings). The larvae will either hibernate (diapause) until next season–some will even remain in diapause for an extra year or two–while others emerge as second or third generation moths later in the same summer. Pupae are brown and vary in size from 10-12 mm in length. They lie inside a cocoon spun by the mature larva beneath bark scales on the tree or in a sheltered place at the base of the tree. Adults begin to emerge once a specific temperature is reached in the spring. The adult moth is about 10-12 mm long with a wingspan of 19 mm. It is mottled brown and grey in colour with bronze-coloured bands on the end of its wings. The front wings are usually square tipped. While at rest, the moths hold their wings roof-like over the body. It is relatively rare to see an adult codling moth in flight. They generally fly at dusk and will usually stay close to the host tree.